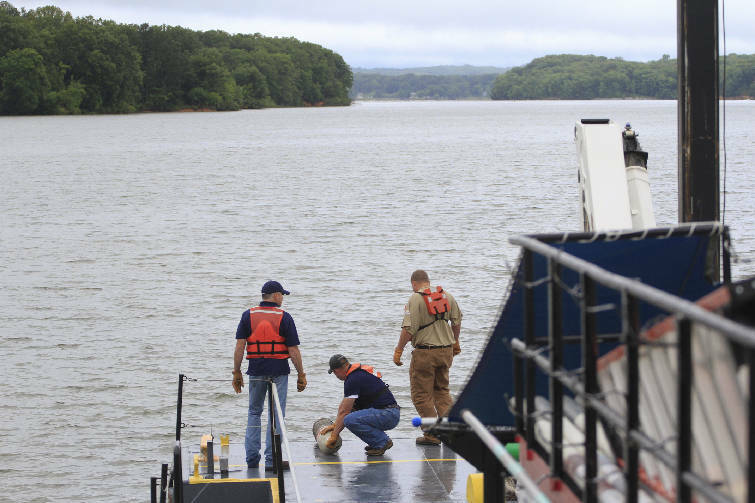 Chad Gower, Brent Smith and Mike Foster, from left, work to replace a damaged Chickamauga Lake channel buoy while aboard the the TVA service vessel Sideview on Monday. Despite recent rains, several reservoirs managed by TVA have lower water levels because of below-normal rain and runoff this spring. Those reservoirs -- including Hiwassee, Nottely, Normandy, Norris and Cherokee -- may not reach targeted summer recreation levels by June 1, TVA says. With lake levels at some tributary reservoirs down as much as 8 feet, recreation will take a hit, as will power production. Hydroelectric generation is running 12 percent below normal, according to TVA officials. Hydropower is the federal utility's cheapest source of electricity, but accounts for only about 8 percent of TVA's power production. But boaters, swimmers and anglers are really high and dry. The Hiwassee Reservoir, on the upper reaches of the Hiwassee River in extreme western North Carolina, is the most affected. That lake is averaging about 8 feet below normal for this time of year. The Hiwassee flows into the Tennessee River near Calhoun, Tenn., 29 miles upriver of the Chickamauga Dam. North Georgia's Nottely Reservoir, in the Chattahoochee National Forest on the southeastern edge of the Tennessee River watershed, is down 4.5 feet. Normandy Reservoir near Winchester in Franklin County, Tenn., is 6.3 feet below summer target, according to David Bowling, TVA river forecast center manager. "We're holding onto as much water as we can," Bowling said. The agency must release some water from those reservoirs for drinking water and downstream habitat. TVA tries to bring the lake levels up each year by June 1 and hold them there, if possible, until after Labor Day. John McCormick, senior vice president of river operations, said the rains over the weekend and Monday helped, but were not quite enough. "Although we had a lot of rain early in the winter, the spring months had below-normal rainfall, and it is unlikely that some reservoirs will fill to their summer water levels this year without above-normal rain over the summer," he said. Rainfall since the first of April is 92 percent of normal in the eastern Tennessee Valley above Chattanooga, and only 53 percent of normal downriver, including West Tennessee, spokesman Travis Brickey said. Rainfall runoff is even more off, Brickey said. Already, vegetation along streams and rivers is soaking up most of the runoff. The reservoirs are getting only 72 percent of normal runoff upriver of Chattanooga and only 20 percent below the city, Brickey said. Adding a double whammy, the entire United States has been warmer than normal this year, according to the National Oceanic and Atmospheric Administration. "January to April was the warmest such period on record," and precipitation was much below normal, according to the NOAA announcement. Brickey said the U.S. Drought Monitor states that areas around Shelbyville in Bedford County, Winchester in Franklin County and Tullahoma in Coffee County "are having their driest period ever on record." McCormick said the solution lies with Mother Nature.